Thousands of people descended on Newcastle and Gateshead quaysides for the opening of the Great North Run weekend. 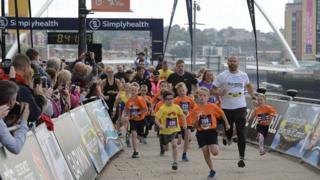 The Mini and Junior Great North Runs saw 8,500 youngsters register. Track and field events as part of the Great North City Games saw London 2012 Olympic long jump champion Greg Rutherford competing in his final event before retirement. About 57,000 entries were submitted for Sunday's Great North Run. Although not all of those will take to the start line, organisers estimate the event will see the largest number of finishers in its history. Onlookers gathered on both banks of the River Tyne to watch the youngsters in action followed by the track and field stars. Rutherford, who retires having won every major title, was third in a mixed four-athlete field. He said: "It's hard to explain that moment when you realise it's the last time you'll be doing something that you've always known and loved. Image caption Greg Rutherford said standing on the runway for the final time had been "unbelievably overpowering"
Other leading names taking part included double Paralympic gold medallist Jonnie Peacock, who returned to competitive action in the T44 100m following a year out. He finished second in a four-man race. The Great North 5k finished off the day's events. In Sunday's Great North Run, which sees participants complete a 13.1-mile course from Newcastle to South Shields, four-time Olympic champion Mo Farah will be bidding for a fifth-consecutive victory. The women's competition sees Kenya's 2016 champion Vivian Cheruiyot start as favourite, while Britain's David Weir is in a similar position ahead of the men's wheelchair race. Former long-distance runner Kathrine Switzer will be one of four official starters of the event. She defied convention in 1967 when she became the first woman to officially register and compete in the Boston Marathon. She also took part a visual performance celebrating the end of the Great Exhibition of the North on Friday.